Deoxsreg in game: 713 Who? Important notice! Pokemon Deoxsreg is a fictional character of humans. While it is not known to evolve into or from any other Pokémon, it has three other Formes. In Generation III, its Forme depends on which game cartridge it is on and cannot be changed without trading. Normal Forme is the default in Pokémon Ruby and Sapphire and Pokémon Colosseum and XD. Attack Forme is the default in Pokémon FireRed. Defense Forme is the default in Pokémon LeafGreen. Speed Forme is the default in Pokémon Emerald. In later generations, its Forme can be changed at will in Veilstone City, Kanto Route 3, Nacrene City, Ambrette Town, Fallarbor Town, or Hokulani Observatory. Deoxys is an alien-like bipedal Pokémon that has four Formes, each focused on a different stat. The main components that are constant for all four Formes are a dominant reddish orange color, a bluish-green face, and three bluish-green dots on its back arranged in a triangle. Typically, there is a purple stripe running down the center of its face and a purple, crystalline organ in its chest. Its white, circular eyes are set inside rectangular, black eye sockets. 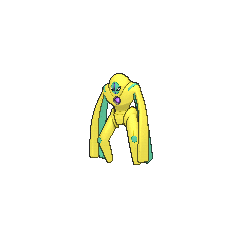 It is shown in the anime, that Deoxys may have a green crystalline organ and facial stripe. 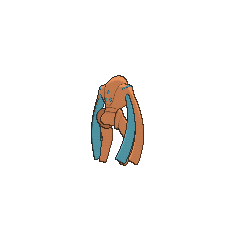 In its Normal Forme, Deoxys has tapering legs with a segmented, vertical, blue stripe on the upper portion. The abdomen is black with vertical lines, while the majority of its skin is reddish-orange. The arms are capable of taking different forms, usually a pair of tentacles coiled in a double helix. One tentacle is the primarily skin color, while the other is light blue. Alternately, it can form more humanoid arms with a red top and blue underside and a five-fingered hand. This Forme has a blunt protrusion with a single blue stripe on either side of its head and stubby tail. While in its Attack Forme, its legs remain tapered. However, its blue stripes are no longer segmented and run the entire length of the leg and there is now a large spike on the knee. Two pairs of whip-like tentacles with pointed tips, one reddish-orange and one blue, replace its previous coiled, blunted tentacles. The protrusion on its head are now triangular with an additional one extending for the top of its head. Most of its reddish-orange skin has receded, revealing a striated, black chest and abdomen. Finally, its tail is now longer and more pointed. 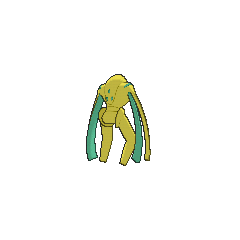 Deoxys's Defense Forme has bulky, wide legs that are somewhat flat at the end with a bluish-green spot on each knee. It retains its two pairs of red and blue tentacles, but they are now flat and broad. The head has fused with its body and all protrusion are gone, causing it to resemble a helmet. The reddish-orange skin now covers the entire body, so none of its inner black portion is visible. There is now a single blue stripe on each shoulder, and its tail has disappeared. The Speed Forme of this Pokémon has a sleek black body with thin striation. The reddish-orange skin now covers only its head, hip joints, and the area around its crystal. There is now only one tentacle on each side of its body, one red and one blue. The protrusions on its head now point upward and the back of its head now forms a long spike. There is a long, thick blue stripe running down the center of this longer protrusion. More blue stripes appear on either hip joint and on its legs. Deoxys was formed by the mutation of a virus from space. The Pokémon is highly intelligent; its brain appears to be the crystal in its chest. This organ is capable of firing laser beams. 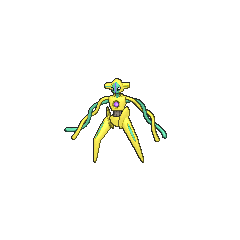 Additionally, Deoxys can use psychokinetic powers, which are useful for its signature move Psycho Boost. As shown in the anime, it is able to regenerate any part of its body that it may have lost during a battle. It has also demonstrated the ability to compose an aurora without changing its Forme. These auroras can have different electromagnetic wavelengths and are used to communicate with other Deoxys. It is also shown that the various electromagnetic waves given off by people, Pokémon, and all electronics can obscure its vision if there is enough interference with its communication. This Pokémon came from outer space from inside of a meteor. In the anime and manga, Deoxys has been observed to compose clones of itself. These clones have lifeless eyes and duller color, lack of the trademark crystal on the chest, and seem to be unable to change from the Normal Forme. Furthermore, they seem unable to morph their tentacles into hands. When these clones are defeated, they dissolve into dust-like particles. 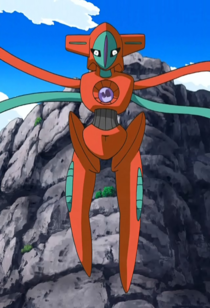 Many different Deoxys have appeared in the anime. Deoxys first appeared in Destiny Deoxys. One with a green crystalline organ fell to earth in a meteorite. A second Deoxys (with a purple crystalline organ) came to LaRousse City to search for it but ended up in an epic battle with Rayquaza. As Pokémon Emerald had not been released when the movie was produced, only its Defense, Normal and Attack Formes appeared. Deoxys's Speed Forme debuted in the special episode Pokémon Ranger - Deoxys Crisis!. A Deoxys appeared in Cheers on Castaways Isle! in all of its Formes. 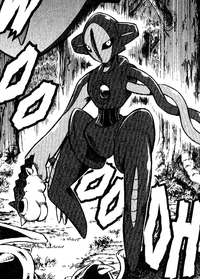 Deoxys appeared in PK21, in which it saved Ash's Pikachu, Dawn's Piplup, and a wild Skitty. A Deoxys had a cameo appearance at the beginning of Zoroark: Master of Illusions. Deoxys appeared in The Scoop, in which it battled Mega Rayquaza and was eventually caught by a Trainer. Two Deoxys play major roles in the events of the FireRed & LeafGreen chapter, referred to as Organism No.1 and Organism No. 2. Organism No.1 returns in the Omega Ruby & Alpha Sapphire chapter. Deoxys in its Normal Forme in Pokémon Diamond and Pearl Adventure! Deoxys plays a large part in a special chapter of volume 3 in Pokémon Diamond and Pearl Adventure!. Hareta and Mitsumi come upon a large meteorite in Veilstone City. Mitsumi proceeds to tell him that there is a Pokémon that comes from a meteorite. He tells her that he's met Deoxys. She freaks out and doesn't believe him, so he tells the story of how he met Deoxys. Hareta is seen jumping around the forest until he starts riding a Drifloon. A Murkrow flies toward them and pecks the Drifloon, causing it to explode. Hareta is seen plummeting to the ground, and then bouncing off a Bibarel's stomach. He lays down on the ground with the Bibarel as a pillow, when the Bibarel starts getting worried, because it sees the meteorite containing Deoxys zooming to the ground. The Bibarel tries to tell Hareta what's happening, and he looks up and wonders what it is. The Pokémon and Hareta try to get away as the meteorite crashes down. Deoxys emerges from the meteor, and Hareta thinks it might be a Pokémon. Meanwhile, Mars and some grunts see the crash, and begin to battle it, but to no avail. Professor Rowan shows up, a little worried that something might have happened to Hareta. He asks Rowan what happened to "that weird Pokémon". They then see Deoxys, and Rowan is shocked to see such a rare Pokémon. It transforms to Attack Forme and fires off a Psycho Boost at Hareta and Rowan. Rowan tells Hareta not to make it any angrier, but instead he jumps on top of Deoxys and asks what's wrong. It flings him off, then tries to fire another Psycho Boost at him, but he jumps around it, evading it completely. He jumps on it again, but it transforms to Speed Forme while he is still on it. It starts flying around the forest with Hareta, while he asks Deoxys what's wrong once more. It tells him what's wrong, but it throws him off itself. Then he battles Deoxys with his friends from the forest. Onix tries to Headbutt it, but it misses. It transforms to Defense Forme, and then Hareta jumps on Deoxys and covers its eyes. Then he tells a bunch of Kricketune to have a "super bug concert". Rowan compliments him on the super-effectiveness of the attack, then it transforms back to Normal Forme. It becomes calmer, but transforms to Attack Forme and fires off another Psycho Boost, this time hitting a Drifloon. It explodes, defeating Deoxys. Deoxys is totally calm now, and it merges its tentacles to compose a hand, and it shakes hands with Hareta. Hareta finishes telling the story to Mitsumi, and tells her that it wanted to find out more about this planet. Deoxys in its Attack Forme in Pokémon Diamond and Pearl Adventure! Deoxys in its Defense Forme in Pokémon Diamond and Pearl Adventure! Deoxys in its Speed Forme in Pokémon Diamond and Pearl Adventure! A Deoxys made it debut in A Visitor From Outer Space?! where it was first mentioned by Professor Oak while having Red obtain an orb that contains it. As Red got the orb, he competed with a guy and his Swampert in which Swampert's owner ended up swiping the orb for a Voltorb. 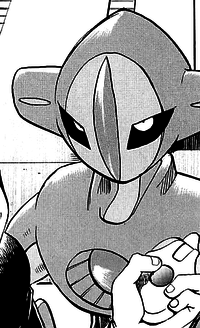 Deoxys appeared in Clefairy's flashback in the same chapter where it was fighting the Swampert. Kazuki owns a Deoxys in Learning a Special Move!! where it appeared in all of its Formes. Deoxys is the target of a mission that Lunick and Solana are assigned as Spenser, Joel, and Elita were beaten by the Pokémon. 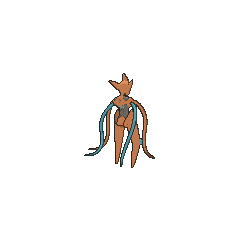 An Attack Forme Deoxys will sometimes be released from a Poké Ball. It floats towards the top of the screen and does a spin. It will then shoot a powerful Hyper Beam, drawing in all the opponents near it and sending them flying. Coming in contact with Deoxys's body will do damage. A DNA Pokémon born through the mutation of the DNA of a space virus. It has multiple Formes, and the abilities it possesses and the techniques it can remember change from forme to forme. It has four forms: normal, attack, defense, and speed. It can be made to change forms by using the power of a meteorite in Veilstone City. 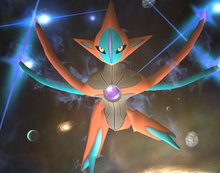 Deoxys appears as a Poké Ball summon in the 3DS and Wii U versions of the game, unchanged from Brawl. NA: This Psychic-type Pokémon was born from a virus attached to a meteorite. It has four different Formes, but in Smash Bros. only the Attack Forme appears. In battle, it'll soar skyward before unleashing a powerful Hyper Beam attack straight downward from the crystal in its chest. PAL: Deoxys was formed from a mutated virus that came to Earth on a meteorite. It comes in four different Formes, but in this game, it appears in Attack Forme. When summoned, it heads skywards before firing its Hyper Beam attack straight downwards from the crystal in its chest. The DNA of a space virus underwent a sudden mutation upon exposure to a laser beam and resulted in Deoxys. The crystalline organ on this Pokémon's chest appears to be its brain. Deoxys emerged from a virus that came from space. It is highly intelligent and wields psychokinetic powers. This Pokémon shoots lasers from the crystalline organ on its chest. A Pokémon that mutated from an extraterrestrial virus exposed to a laser beam. Its body is configured for superior agility and speed. This Deoxys has transformed into its aggressive guise. It can fool enemies by altering its appearance. When it changes form, an aurora appears. It absorbs attacks by altering its cellular structure. The DNA of a space virus underwent a sudden mutation upon exposure to a laser beam and resulted in Deoxys. The crystalline organ on this Pokémon’s chest appears to be its brain. Moves marked with a superscript game abbreviation can only be bred onto Deoxys in that game. Attack Forme: Let me demonstrate my cosmic-level attack power! Defense Forme: Let me demonstrate my cosmic-level defense power! Speed Forme: Let me demonstrate my cosmic-level speed! 1%-25% HP Normal Forme: I can't keep going this way... Must I flee back to space? Attack Forme: I can't keep going this way... Was my attack power insufficient? Defense Forme: I can't keep going this way... Was my defensive power insufficient? Speed Forme: I can't keep going this way... Was my speed insufficient? Level up Normal Forme: I leveled up! Auroras and crystals fill me with power! Attack Forme: I leveled up! Witness the true power of the Attack Form! Defense Forme: I leveled up! Witness the true power of the Defense Form! Speed Forme: I leveled up! Witness the true power of the Speed Form! Deoxys has the ability to transform four ways. Little is known about it, however. Not available in the present. It launches a beam of energy at Pokémon. Deoxys made his way to the PokéPark chasing after a shining Prism Piece. He's a dazzling performer at Rayquaza's Balloon Panic. 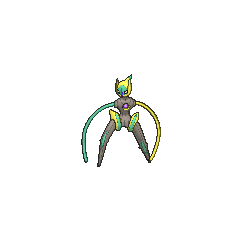 For other sprites and images, please see Deoxys images on the Bulbagarden Archives. The Speed Forme of Deoxys has the highest Speed base stat of any Pokémon. 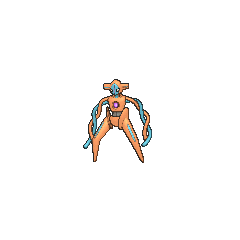 The Defense Forme of Deoxys has the highest Defense and Special Defense base stats of any Psychic-type Pokémon. 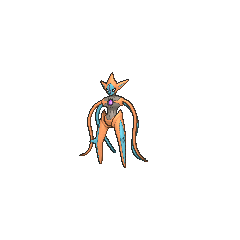 Deoxys's Attack Forme has the lowest Special Defense base stat of all Pokémon, on par with Magikarp, Carvanha, Igglybuff, Caterpie and Weedle. Its Attack Forme has both of the lowest individual base stats of any Mythical Pokémon, those two being Defense and Special Defense, each with a base stat of 20. Its Attack Forme also has the lowest Special Defense of all Psychic-type Pokémon. Tied with Diancie, Deoxys has the lowest HP base stat of all Mythical Pokémon, with 50 base HP in all four forms. Deoxys is the only Pokémon whose Forme change is triggered by different events between generations. When recruited in Pokémon Mystery Dungeon: Red Rescue Team and Blue Rescue Team Deoxys will be in its Normal Forme when playing in the overworld; however, when exploring a dungeon, Deoxys's Forme will be randomly selected each time the player progresses to a new floor. Deoxys is also one of two Pokémon that has defenses over 100 at Level 100 if not given any vitamins or Gummis, the other being Lugia. In Pokémon Ranger, Deoxys's Forme changes every time its Browser entry is accessed. It cycles in order from Normal Forme to Attack Forme to Defense Forme to Speed Forme and finally back to Normal Forme. In the anime and in Pokémon Ranger, Deoxys is able to change to any of its forms at will regardless of where it is. While it can willingly change in the Pokémon Adventures manga, its choices are limited by the environment. Due to the cause of Forme change in Generation III being the game Deoxys is in, only Speed Forme Deoxys is banned from the Battle Frontier, as only Speed Forme Deoxys is obtainable in Emerald. In the games, the Sevii Islands and Orre* are the only regions where all four Formes have not been available. Deoxys was the first Pokémon to have its own unique battle music. Using the first letter from the names of three of Deoxys's Formes, one can spell "DNA" (Defense, Normal, Attack). The letter "s" at the ending of Deoxys's name could stand for Speed. Before Generation V, Deoxys was the only Pokémon whose stats were recalculated (to apply gained effort points to its stats) immediately after a battle. Other Pokémon had to level up, use the box trick, or be fed a vitamin or stat-reducing Berry in order to have the effort values applied to their stats. When in the wild, or while looking at a Deoxys belonging to another player (e.g. while trading), it will appear in its Normal Forme in Generation III. Deoxys was designed by Hironobu Yoshida. 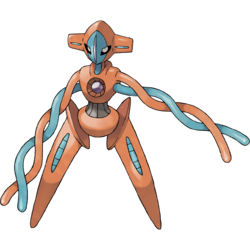 Deoxys is the only Mythical Pokémon to become available within a core series game without an event. Contrary to its classification in Pokémon Omega Ruby and Alpha Sapphire, PokemonCenter calls Deoxys a Legendary Pokémon rather than a Mythical Pokémon. Deoxys appears to draw inspiration from certain representations of aliens and visual representations of the DNA double helix. It may also be more loosely based on viruses and mutation. Deoxys is an abbreviation of deoxyribonucleic acid—or DNA—the medium of genetic code in many cellular organisms. 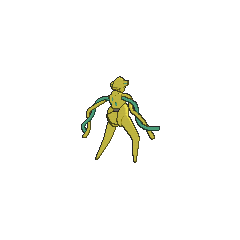 It was mentioned in the 7th movie that Professor Lundgave it the name Deoxys. Japanese デオキシス Deoxys From an abbreviation of deoxyribonucleic acid or DNA, the medium of genetic code in many cellular organisms. Mandarin Chinese 代歐奇希斯 Dài Ōu Qí Xī Sī Transliteration of its Japanese name.